A corporate logo is a must for every business owner. If you want to become a respected professional in your niche, you need to put lots of effort into designing your brand identity. When it comes to the photography business, a logo can tell a lot about your artistic skills and expertise. It can help your potential customers understand your approach to photography, get insight into your style and signature tricks. At the same time, it’s crucial to understand that your branding does not define your photography skills. You can pour tons of money into creating a stellar brand identity, but this won’t make your business prosper unless your photography skills are up to par. Before promoting your brand, make sure you and your customers are satisfied with the quality of your work. After all, your expertise is the cornerstone of your brand. The photography industry is a highly competitive field, with a plethora of talented professionals vying to stand out from the crowd. This is where branding comes into play. 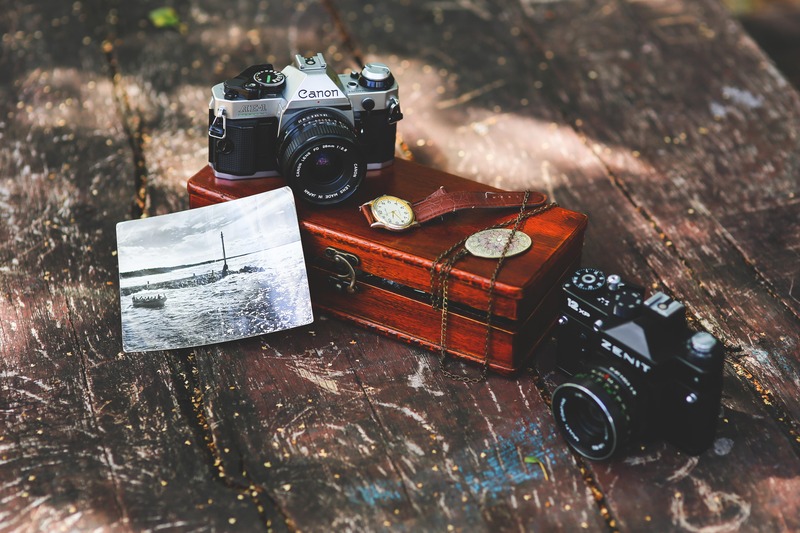 If your and your competitors’ photography skills are at the same level, apt branding can distinguish your business and make all the difference between failure and success. As you might already know, a logo is the central element of brand identity. What makes a good photography logo? First and foremost, it must tell your audience about your niche (wedding photography, portraits, etc.) and outline your artistic style. Methods and tools to create a logo are plenty. The problem is how to choose the one that meets your needs. Unfortunately, there is no one-fits-all solution. You can choose to design your logo yourself. After all, you must know Photoshop like the back of your hand! Let go of the boundaries and stereotypes and let your inspiration guide you. You’re an artist, remember? The easiest way is to create a logotype with your name on it. Search the internet for free fonts (FontSpace, MyFonts, etc.) and pick the one that suits your personality. If you’ve set your eyes on a combination mark, you can add a minimalist icon and simple graphic elements. On the flip side, there is a risk that you may end up with a design you don’t like! It would be a pity to realize that you’ve poured hours of hard work down the drain. To play it safe, you can commission a freelance designer or design studio to do the job. Design services cost money, but at least you’ll be sure that your future logo is in good hands. The most important thing to understand here is that your selected contractor knows nothing about you and your brand. Take ample time to have a proper talk with your designer and explain what emblem you’d like to get. Be prepared to go into every detail. If time is not a factor for you, you can hold a design contest. Hundreds of designers will share their vision of your emblem with you, and you’ll have to pick one winner (or as many as your budget allows). If you want to learn how to work with photoshop, check Photography Workshops. Last but not least, online logo making services seem like a worthy alternative to all the above methods. With a smart logo creator, you can craft a custom logo without watermarks, borrow exciting design ideas, and admire inspirational examples. For the most part, photographers put their real name or nickname on their emblem, and for a reason. Out of all types of logos, a logotype looks best as a watermark. At the same time, it’s not uncommon that photographers prefer more sophisticated logos with images, graphic shapes, visual effects, etc. When making the choice, consider not only your personal preferences but also your niche, whether it’s sports, nature, vintage, aerial photography, etc. 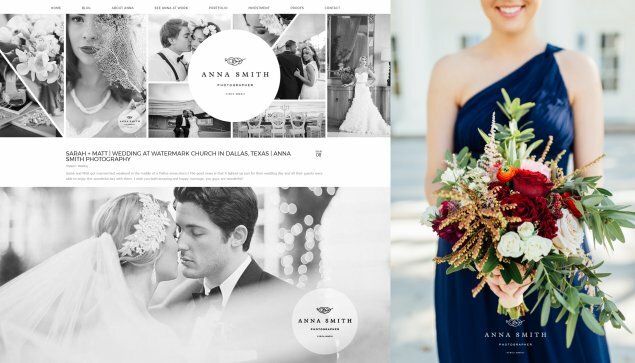 On the logos of wedding photographers, you can see elegant geometry, refined inscriptions, minor details, etc. If you’re shooting sports events, go for bulky fonts and bold hues. Each photographer chooses the design elements resonating with their audience. When working on your logo concept, think about how your emblem will look on your photos as a watermark. Whether it’s an image or word, your emblem must not distract the attention from the photo. Make sure your watermark is subtle and unobtrusive. Plus, your logo must look good on your website. What icon to choose? Of course, you can’t go wrong with photography-related items, such as a camera, lens, film, etc. In the apt hands, even the most standard image can turn into a memorable artwork. For example, playing around with gradients and negative space is always a good idea. Ready to create a logo for your photography business? You’re not alone! Logaster is here to help. 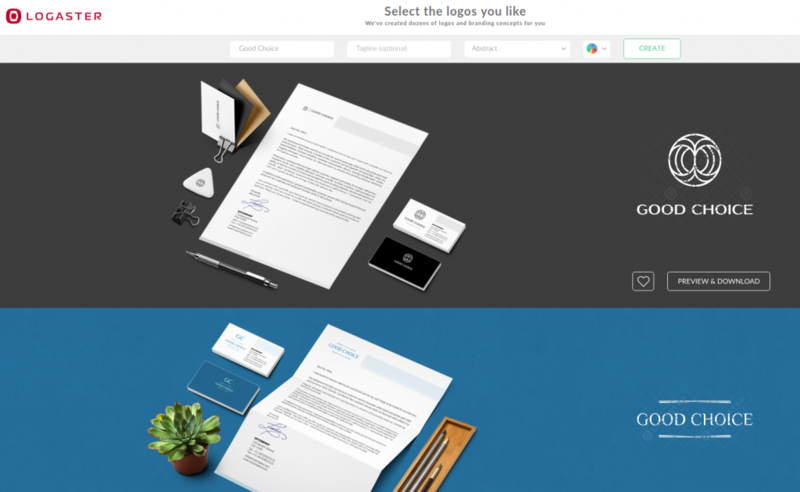 To create a logo with Logaster, enter your brand. The service will provide you with dozens of photography-related logo samples. You can search icons by keywords and categories. Pick your favorite icon and edit it, if necessary. When choosing the right color palette for your emblem, you must be very careful. Think about the most common hues on your photographs and choose the matching color(s). Some photographers prefer to play it safe by using black and white colors in their logos. Indeed, black and white will make for a stylish watermark. We strongly recommend that you consider this option unless you have a better idea for your emblem. On Logaster’s website, you’re sure to choose the right hue from a stunning color palette. We bet you’ll be amazed at our collection of colors! A font is a major design element in any logo, regardless of its theme. Choosing a font is a big deal, so pick wisely. If you specialize in black and white photography, use a simple yet elegant typography without too many distracting details. If, however, you make photos of pets or children feel free to experiment with handwritten fonts. Regardless of your niche, make sure your selected typography is clean and easy-to-perceive. Place your logo on one of your pictures and see whether you can read it. Often, a font may look good on a website, but hard to read on a photograph. Nowadays, new fonts are emerging every day. How not to go astray surrounded by such abundance? Give preference to classic yet trendy fonts, such as Garamond or Futura. Timeless and stylish, classic fonts can add weight to your brand identity. 1. Keep away from exquisite fonts with tiny scrolls, curves, etc. While visually appealing, they can make your logo unreadable. 2. Make sure your selected font works well with your icon. Pair a massive icon with a bulky font, such as After Disaster, Europe, etc. 3. Always put practicality ahead of beauty. A pretty but hard to read font can ruin all your creative efforts. Make sure your typography is equally easy-to-read across different surfaces and contexts. Never underestimate the power of arranging the logo elements in a wise way. Remember that a logo can only have one central element. If you’ve decided to highlight your brand name, your icon and colors must not distract the viewer’s attention from the word (s). Plus, you need to adjust the distance between different elements. Since photography logos are often used as watermarks, we’d recommend using a horizontal layout. It’s the best option, as it’s low key and takes minimum space. With Logaster’s editing tools, you can customize the size and arrangement of logo elements, as well as adjust the distance between them. Colors are a powerful design tool that must be used with great caution. Don’t go overboard with too many hues though it’s hard not to get carried away by a plethora of splendid shades in modern color palettes. Keep your head cool and stick with 2-3 hues that work well together. At the same time, your emblem must not rely on its colors for effectiveness. Make sure your logo looks just as nice in black and white. Between the raster and vector formats, choose the latter. By creating a vector logo, you’ll get a high-definition image that can be printed on photos, banners, etc. without loss of quality. Don’t be tempted to copy your competitors’ ideas. Remember that uniqueness is the most valuable asset of your brand identity. Here is a piece of wisdom for all the aspiring photographers out there. Never stop moving forward and improving the quality of your artworks. While branding is a great thing, it’s your skills that value the most. When it comes to logo design, Logaster logo generator is the expert. Whether you’re a novice or a pro, Logaster can get the task of creating a smart photography logo off your hands. All you need is a little inspiration! Design your own logo right now by following our guidelines! Need one last push to make up your mind? Take look at these beautiful logos lovingly created! Business cards creation became easier with Logaster!